Since I couldn't find the new cookbook on Tuesday when it came out, despite visiting four different book stores, I decided to order it on Amazon. Less than 48 hours later, it was at my doorstep at a huge discount. (Remind me to always buy online.) The book is fantastic. I'm not a big cookbook collector and I don't tend to be that adventurous in the kitchen. 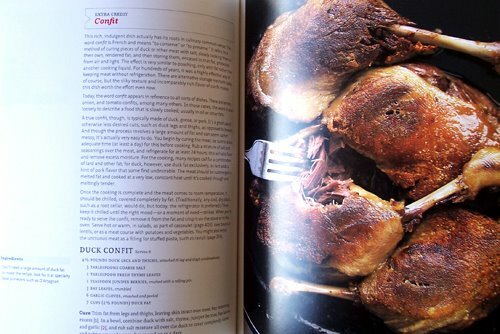 The textbook style of this book, though, may just make me broaden my culinary horizons. But even if it doesn't, I collect Martha's books for all kinds of reasons, not the least of which is design inspiration. The book was designed by William van Roden, who also designed the Homekeeping Handbook, the Everyday Food cookbook and the Baking Handbook. Since the publication of those books, I've become a huge fan of this designer, who uses minimalist strategies to perfectly clarify instructional text in a way that is attractive and engaging. Cooking School is no different. It's a prime example of the well-planned guide. Much of this also has to do with the writing, which was undertaken by Martha and food editor Sarah Carey. The writing is clear, consise and well structured into highly-organized chapters that promote basic culinary techniques, which subsequently graduate to more challenging cooking tasks. All of it is fully illustrated with hundreds of step-by-step photographs. 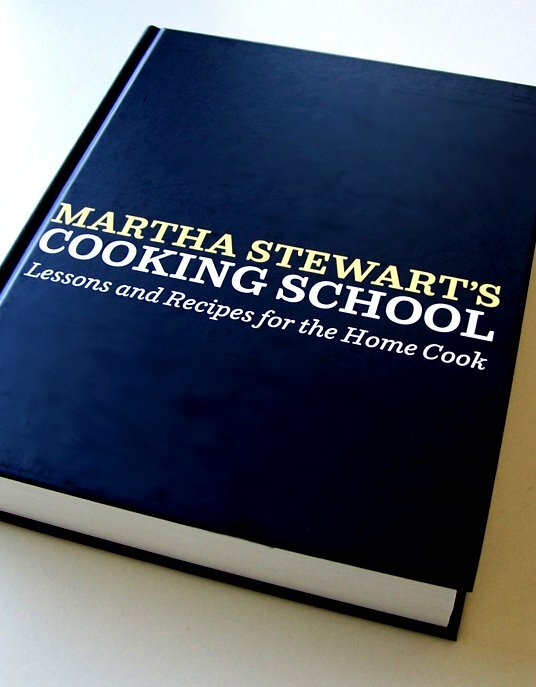 I thought I'd take you 'inside' Martha's Cooking School and describe some of the details. I always take the jackets off my cookbooks. The reason for this is that they don't get damaged and a well-worn book cover can always be covered again with the jacket. I keep the jackets in a small portfolio. I was pleasantly surprised to see this elegant black cover under the jacket. It's authoritative but not intimidating. 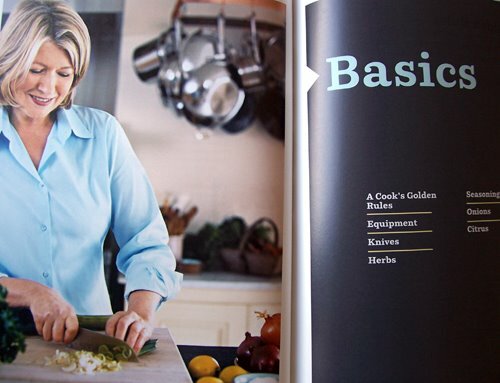 There are numerous new photographs of Martha throughout the book. Portrait photography was undertaken by Ditte Isager while the food photography (below) was done by Marcus Nilsson. The Basics, 1) Stocks & Soups, 2) Eggs, 3) Meat, Fish & Poultry, 4) Vegetables, 5) Pasta, 6) Dried Beans & Grains, 7) Desserts. Well, I have never, ever been able to make a decent piecrust. Maybe, just maybe there might be some hope for me in this new book of Martha's. I have to wait until Christmas to get it but it will be worth the wait! the book looks great! can't wait to order!